CEMS NIGERIA and UTEX INDIA is organising the first of its kind Expo and Exhibition in Nigeria with strategic partnership with DOSARAF MULTTIBIZ KONCEP to host Nigeria International Agro Chemicals and Agro Equipments Expo (NIAA) holding at Abuja International Conference Center, FCT Abuja, Nigeria from Monday 15th– Thursday 18th January, 2018. WHAT IS NIAA WEST AFRICA? 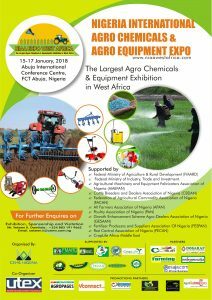 Nigeria International Agro Chemical and Agro Equipment Expo, West Africa, NIAA WEST AFRICA is a B2B platform that will feature wide range of Agro chemical products and live technology demonstrations of Agro equipments. NIAA WEST AFRICA will offer a unique productive B2B opportunity between the world’s leading Agro chemical and Agro equipment companies and Stakeholders, Government Departments, relevant Associations and NGOs to formulate active business opportunity. Also NIAA WEST AFRICA will provide skills acquisition and Tech-know-how on the latest Agritech trends for farmers from the free-to-attend interactive training seminars. First agro chemicals and agro equipment’s tradeshow in West Africa. Skills acquisition and tech-know-how avenue. West Africa is one of the largest agricultural business hub in Africa, with a total geographical area of 6,140,000 km2, or approximately one-fifth of Africa. Its estimated population was 371,315,193 million people in 2016, and its population growth rate is 11% per annum. Nigeria, the largest agriculture business hub in West Africa, its economic statistics reveal annual economic growth rates that averaged over 7% in recent decades, making Nigeria one of the fastest growing economies in West Africa. Agro Chemical: Agro chemical contributed 55% to the agricultural development in Nigeria and other West Africa countries. More than 125 million people is the estimated commercial farmers while about 55 million are in rural farming, managing assets of about 820 billion. In view of this; Nigeria displaying big potential in the use of agro chemicals and agro equipments than any other countries in West Africa. In order to facilitate for advance farming technology to support this current status, Nigeria and other West Africa countries need a productive platform for all stakeholders to share knowledge and display latest technology. For Exhibition Floor Plan, Exhibition Application Form containing dimension and cost of exhibition and other necessary details visit www.niaawestafrica.com. Visa application assistance is available for international partner’s and exhibitors.